More Make It Fast, Cook It Slow Review and Giveaway. For the First Order of Business, it is time to announce the winner for last week’s giveaway of The Gluten-Free Almond Flour Cookbook, by Elana Amsterdam of Elana’s Pantry. Hallie, I will contact you to arrange delivery of your exciting prize: A signed copy of Elana’s Book! Congratulations! And now onto this week’s treat! Update: This contest has ended. To find out who the winner is, please go here. Did you see Stephanie O’Dea on Good Morning America yesterday? If not, you must watch her. She (and that adorable outfit) rocked it. She was making chili and talking about her newest cookbook, More Make it Fast, Cook It Slow: 200 Brand-New, Budget Friendly, Slow-Cooker Recipes, which is the follow up to her first cookbook, Make It Fast, Cook It Slow: The Big Book of Everyday Slow Cooking. Stephanie O’Dea is tiny in size. I know this because when I met her at BlogHer Food last fall, she was the same height as me – I love a fellow squirt. But, that personality of hers is larger than life. She has this bubbly sense of humor that will keep you in stitches. She also likes reality television. I will not name which shows she watches. This is only because they are the same ones that I watch. I am not always proud of the train-wrecks that I get sucked into. A few years ago, Stephanie got the wonderful idea to tackle the challenge of using her Slow-Cooker every day of the year of 2008. She chronicled it all on her hysterical blog, A Year of Slow Cooking. As a busy mom of then 2 (and now 3) children, she wanted to find the best way to get an easy, healthy (GLUTEN-FREE) meal on the table for her family, without the hours of prep time in the kitchen. She met that challenge. She actually blew it out of the water. And in the process, she gained the distinction of being an award-winning blogger AND a New York Times Best selling author. I adore her first book. I have used it endlessly and have shared it with so many of my friends. And her latest cookbook takes her first one step farther. While she again shares tips and ideas for time-saving strategies that will make working with your slow cooker even easier, she also actually divides the book into three main sections: $7 and under, $10 and under, and $15 and under. Each of these sections is then further broken down by recipe category. Perfect for anyone trying to keep their family on a budget. I also love how she includes “The Verdict” at the end of each recipe. She tells us, in her own easy way of writing, what she and her family thought of the recipe. I have actually made quite a few of the recipes from her book. They have all turned out great! My husband loves when I pull out the slow-cooker. I think it reminds him of his childhood. And he has not been disappointed yet with any of the recipes we have made. To date, I have made the Honey Garlic Chicken, the Taco Lasagna, the Herb Garden Chicken , and the Chicken Cacciatore. Each has received the thumbs up distinction from my crew here. 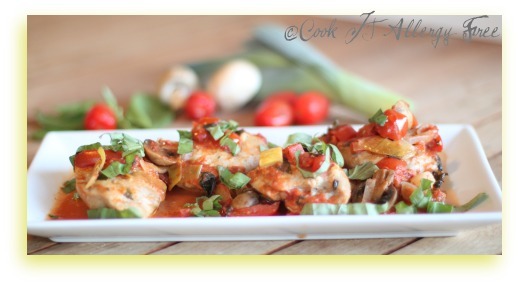 The picture below is of the Chicken Cacciatore. It was a HUGE hit. I had planned on eating the leftovers for lunch the next day while my crew was off at school and work. I was sorely disappointed when there was not a bite left to stash away for the following day. Bad for me. Great for a rave review of the meal. Okay. On with the giveaway. 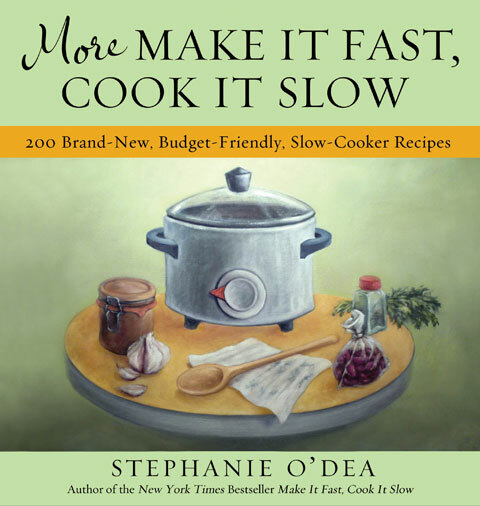 I am giving away a copy of Stephanie’s latest book: More Make It Fast, Cook It Slow. You can enter to win by leaving a comment here telling me how frequently you use your slow-cooker. If you leave a separate comment telling me you have followed Cook It Allergy Free on Facebook, I will even give you a second chance to win. If you want, you can leave another comment telling me you followed Stephanie O’Dea on Twitter (if you have an account) for a third chance. This contest will end on Thursday, January 20th at 10 am. I will announce the winner that day. We use our slow cooker a couple times a month. I would LOVE to win her new cookbook!! I use my slow cooker at least once a week in the cold months and a few times a month in the warm months. And I tell all my friends who claim they don’t know how to cook to start with Stephanie’s crockpot recipes. Oh and follow her on twitter too (Preppy Crocodile). I am a huge HUGE fan!! We use our slow cooker about once a week but wish it was more! I have just started to dive into the world of slow cooked breakfast and lunch. I would love recipes that accommodate our gluten free lifestyle! I also (just now) follow Stephanie O’Dea on twitter. I also follow and ‘like’ cook IT allergy free on facebook. So glad for resources like yours! I use my slow cooker very little; I’m thinking once every 6 weeks. But I would LIKE to use it more. Maybe then my family would get a decent meal instead of our constant roasted vegetables, (which is fine except for the lack of variety). How often do I use my slow cooker? Not nearly often enough – so I need an excuse to use it! I love using the crock pot but need new recipes. I rarely used my slow cooker until the whole fiasco with my stove (you know, where I didn’t have one for weeks). Out came the slow cooker and now I’ve been using it about once a week. We’re all loving it and I’m always looking for new recipes. I use my slow cooker at least weekly…it now has been almost twice a week. I use her first cookbook and it’s well used. I would love to win her new cookbook. I use my slow cooker a couple of times a month. Have you tried Shirley’s (gluten free easily) Pumpkin Butter slow cooker recipe. It’s WONDERFUL and EASY. I don’t use my slow cooker very much because I just don’t have recipes for it. Mostly use it for roast or chili. I don’t use my slow-cooker often enough, lol. But DH bought me a new one for Christmas and now I have two, one bigger than the other. I foresee many more slow-cooker meals in our future!!! I hope to do at least one a week. I follow Cook it Allergy Free on FB, too. I use my slow cooker about once a week during the winter months. i only use my slow cooker when i can find a recipe or recipes that sound fantastic. i would love to use my slow cooker a lot more. i have at least 4 slow cooker books, but more times than not, when i make on of their recipes i think, meh. i would love to play around with this book. Use of my slow cooker varies; sometimes a couple of times a month, sometimes once a week. I like to use it more in the summer so that I don’ t have to use my oven. Please enter me! I like Cook It Allergy free on facebook. I, gasp, do not own a slow cooker! But, if I had a recipe book for how to put one to good use I would likely be inspired to splurge on one! I am a fan of yours on facebook…love the recipes and tips! Keep them coming! I follow Stephanie and love her blog! She’s fabulous and very creative in the kitchen. Her mongolian beef is AMAZING if you haven’t tried it. Sadly, I am somewhat of a slowcooker rookie… all the more reason for a gf slowcooker cookbook! My mom only ever used her little slow cooker for making spaghetti sauce (which was always amazing) so I really didn’t have much to go on when my grandma gave me one for christmas a few years back. In the 2 years (atleast) since acquiring it, I can probably count on one hand the number of times I’ve used it. I know tons of people who rave about theirs, and I would LOVE to be one of them! I use my slow cooker a few times a month. Thanks to Stephanie O’Dea, I use my crockpot several times a week. I love using it and I am so thankful for Stephanie’s GF recipes. I follow & “liked” Cook it Allergy Free on Facebook. I use my slow cooker at least once a week. Sometmes more especially during the winter months. At least twice a week – and I’m always looking for new recipes! I use my slow cooker at least once a week. If I am having the whole family out for a meal, I will often have 2 of them going at once. Easy for making ahead giving me time to visit instead of cooking. We use our slow cooker at least 3 times a week- (SCD diet) ….. even use it to make yogurt!. Slow cookers are actually great to use in the cafe for breakfasts. Just set it up the night before and when you walk in it’s ready to go out to the customers! I love Stephanie O’dea’s recipes! I also love my crockpot and use at least once a week in the colder months and few times a month during the summer months. about 3 or 4 times a week. We ski every Sunday and it’s always there w/ us! I’m now a fan on Facebook! And I’ve followed Stephanie. Thanks for doing the giveaway! Best of luck to all! I am a follower on Facebook! I don’t use my slow cooker very often. I am never sure what I want to fix in it so just do same old meals. I need to find a book that will get me started using a slow cooker. Surely some soups and stews in one would be super during this cold weather. I use my slow cooker every Sunday. Extra days to make beans to keep in the freezer (to keep from buying canned beans). I love slow cooking, mostly I have gotten into solar cooking which of course is slow. On the days that we don’t have sun like yesterday, I use my slow cooker. I went over and checked out her site and it is amazing. It gave me lots of ideas. Thanks for showcasing her in your blog!! And I also follow you on FB! I love FB so am happy to get your updates there. I use the slow cooker a few times a month…..I need this book so I can do more! We use ours about twice a month, though I would love to use it much more often! I’m a fan on Facebook. I’m following Stephanie on Twitter @MommaStaciA. Thanks! I use my crockpot at least once a week. I like to use it to make my chicken stock. Put everything in and let it go overnight. I am following Stephanie on twitter. I have plans to use it once a week now that I have Stephanie’s first book. The children and I are going to choose one thing to try. 🙂 Until now it was infrequently. I use a slow cooker at least once a week if not more. Always looking something different to try that’s kid friendly. Not often enough – I get it out once a month or so but I want to start using it at least once a week. I never seem to know what to make and with my daughters new diagnosis of multiple food allergies I could use some good resources!!!! I watched the video of Stephanie online, she was so cute! I’m not entering, I just got the book actually and it looks so great. I can’t wait to dive in. You always seem to think you are shorter than you are! Stephanie is closer to my height, and I’m definitely pint-sized next to the whole gluten-free gang 🙂 I think her huge smile and perkiness makes her seem like she’s ten feet tall though! I read all of your posts and my husband cooks many of your meals (I am on bedrest)- I’d love to get him to use the crock pot more- it would save him time. We use it maybe once every 3 months! I am also following you on Facebook! Great site! Haven’t tried the book but iam looking for healthy slow cooking as I am now the USA mom of two exchange student so I need easy good healthy recipes. Love this site I learn lots! Thank you! I am following you on Facebook and love it! I love using my slow cooker and use it about once a week. I use my slow cooker about 3 times a month. Would like to use it more! I don’t use my crock pot as often as I would like since my hubby insisted on getting a huge one. I am using it more now that I found the crockpot365 website. I have been following you on facebook for a while now. That is how I found out about this lovely give away. I don’t use my slow cooker nearly enough! I got Stephanie’s first book for Christmas though, and have picked out a couple dozen recipes I’m itching to try! As a busy working mom I use the slow cooker about once a week. I am following you on facebook! I haven’t used it as much as I should have…I am improving though- trying to adapt favorite family recipes to my crock pot! I follow Cook it Allergy Free on Facebook! This is an wonderful blog and resource! Thank you so much! I have just discovered your site and now all the others that come with it! It’s inspiring. I just started to follow Stephanie’s as well! I RARELY use my slow cooker even though i purchased a big enough one to allow for leftovers, because……………I have not found many recipes that we truly enjoy. I probably use it 2-3 times a year. Now that i have been diagnosed with gluten and other allergies, I would greatly appreciate finding recipes that we do enjoy because I would spend much less time cooking (which seems to be a lot of hours these days).! Thank you! I just started following Cook IT allergy Free today! I look forward to continuing to particpate! We try to use our crockpot about once a week in the winter. I love Stephanie’s recipes and blog although I don’t have either book yet. And now I am following you on FB! You do the best reviews, Kim. And if there was an adorable contest, you and Stephanie would probably tie. Don’t add me to the contest. I have the book and I have one of her recipes in the slow cooker right now, but just wanted to say how much I loved the review and your photo. Hope you had fun on the slopes and when you get to visit with Shirley. I’ve just recently started using my slow cooker and love the flexibility it has! I try to use it at least once a week! I follow you on Facebook and love you’re blog! i use my slow cooker about once a month. i would use it more if i had more recipes. i could use the web or hopefully win this cookbook. thanks, for the giveway. I’m not entering the contest, but I can’t believe I missed this. Whoops! We have our contests ending the same day. I was confused at first. I wonder if I did that subconsciously? Well, I only *just* got a slow cooker. A co-worker had several and wanted to get rid of one so he offered it to me. Now I need to start collecting recipes to try it out! I use my slow cooker a few times a week. It is fast and convenient. I try to use my slow cooker every Sunday. I love the way it makes the house smell, it’s so homey!